Parking and unloading near Edgehill School. Fall brings unchangeable weather. 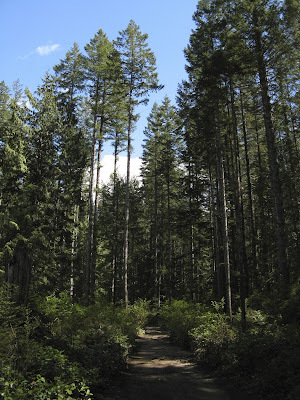 That makes it a good time to explore some of the roads and trails closer to Powell River. Wayne and I treated ourselves to a short quad ride near town. That's easy here in Powell River with trails right outside our back door. We parked our truck and quad trailer near Edgehill School at the head of Abbotsford Street to access the Edgehill Trail system. From here, the trails wind and interconnect with other trails in the area. The Edgehill Trail just beyond the parking area. And they pass through large stands of trees as beautiful as any in the area. The Washout Trail connection via the Edgehill Trail system. The parking area near Edgehill School is a handy launching point that can be used to reach any area east and south of town. The forecast was for a sunny day, but there were patches of fog and cool temperatures along the way. That made the views a bit eerie at times. We rode through the Edgehill system to get to the Washout Trail, our starting point for the main portion of our ride. After a wet and foggy spot on the Washout Trail. The Washout Trail was dotted with big puddles along the way. In places, the Powell River ATV Club's trail building group has created bypasses onto drier soil to prevent damage to the area. In 2012, with a combination of volunteer workers, donated supplies and a $3000 grant from ATV/BC, two replacement bridges were built to protect fish-bearing streams. Well marked junction of the Washout and Blue Trails. At the well marked junction we turned up the Blue Trail. This trail has also been the location of extensive work by the local ATV trail building group. 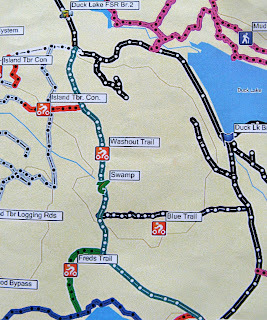 The Blue Trail is a multi-use trail for hikers, mountain bikers, horseback riders and, of course, ATV riders. It's also an interpretive trail used to teach the youth of Powell River about their forest environment. Along the way we saw some unique frost called Santa's Beard. Click here to check it out. A bridge to protect a small fish-bearing stream. You can follow this link to an article ATV/BC for more information about the bridge building project. 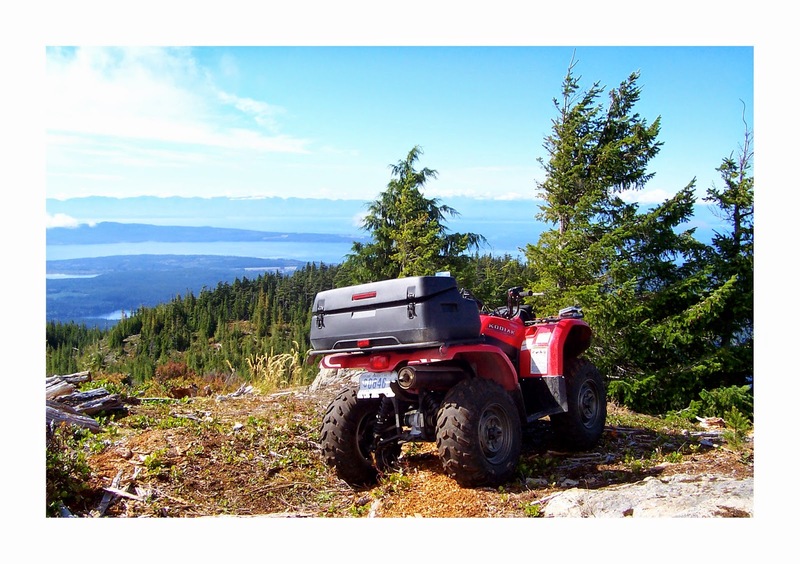 Through the efforts of the Powell River ATV Club, and all the trail builders, everyone has better access to our backcountry with its unparalleled exploring. Do you want to explore the great outdoors in Powell River? Would you like to read books full of stories and maps about our backcountry? 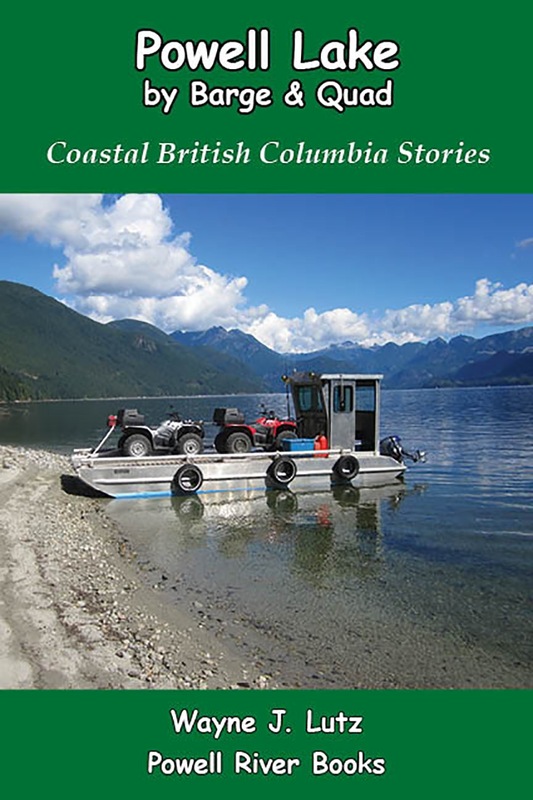 Check out Wayne's Coastal BC Stories series including Up the Main, Farther Up the Main, Up the Winter Trail, Beyond the Main, and soon to be released Powell Lake by Barge and Quad.